Wooo Oilatum! My mam bought me this last year when I ran out of the cream the Dr prescribed me for my eczema. I only developed eczema last Christmas after not having it since I was a child. Dunno why I have it now, but it's been spreading to more places and getting worse. Winter is an especially bad time for it, in fact the last few days prior to writing this have been horrendous because of it. I wanted to share a wee review on it because if you do have incurable dry skin, or eczema, or anything else, this is pretty helpful. First of all it is unfortunately not cruelty free. This bothers me and I am trying to find one that is cruelty free but it's not really a beauty product, though I know I've called it a beauty review, it's something I actually need. A lot of these creams have to be tested on animals by law, as with every single drug you can buy in the UK at this point in time. (I just wanted to mention that 'cos many people don't seem to realise that these medical products have to be tested on animals by law because there are not sufficient, safe alternatives - but that's a post for another day). It is moisturizing and helps calm my skin when it's itching. It's really helped the skin on my face stop flaking and stay smoother, which means I've actually worn make up once or twice so far this year! It has a pump top which makes it easy to get out of the bottle and reapply without getting greasy hands everywhere. If you don't have eczema or really dry skin I probably wouldn't recommend it seeing as it's not cruelty free, and it can be a pain to constantly wipe off your hands. Thanks to my eczema getting worse I bought myself a different, even more moisturizing cream. 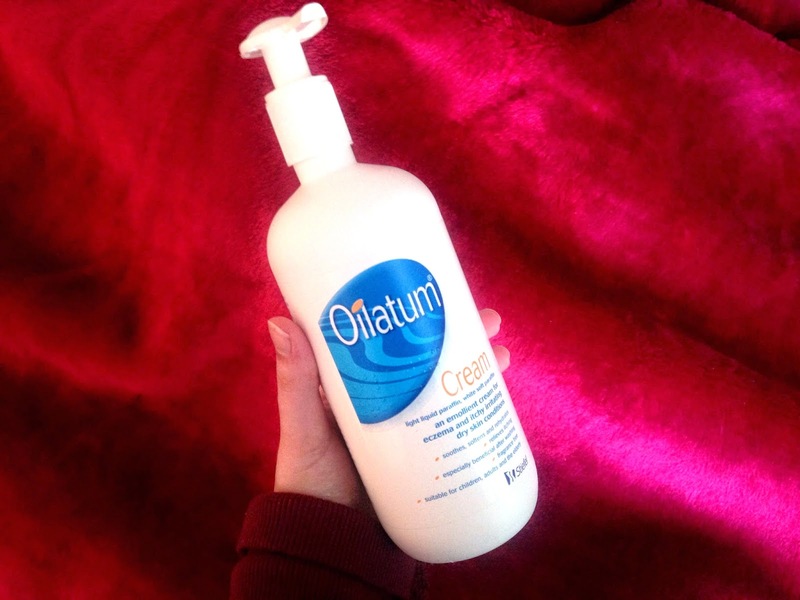 The Oilatum just didn't seem to be doing as well anymore, probably because my eczema had got a lot worse. So it's good for small patches, and for when it's mild and not hugely painful. I know this isn't your average beauty review, and most of you will probably find this useless. But technically this is a lifestyle blog and unfortunately this is part of my lifestyle haha. It's not something that I have experience with but it sounds like it's not too bad. You might just need something extra strength for when it flares up. The most I have to deal with is dry hands from wearing gloves at work.